SIMPLY BEAUTIFUL 3BR + OFFICE/2.5BA HOME IN THE DESIRABLE SEMINOLE LAKE COUNTRY CLUB NEIGHBORHOOD, SITUATED ON A CUL-DE-SAC, WITH FABULOUS GOLF COURSE VIEWS BETWEEN THE 12TH AND 13TH FAIRWAYS! Enjoy lovely exterior curb appeal, with a paver driveway and walkway to a covered porch with a grand double door entry. Inside this home, the chef’s kitchen features new cabinets, granite counters, stainless steel appliances (including a double convection oven! ), an expansive center island with cook top, loads of seating & new lighting. This tri-level floor plan features a formal dining room, a spacious living room with wood-burning fireplace, wet bar, French doors leading to the back patio and a beautiful family room with lots of natural light and beautiful views of the golf course. The spacious master suite has plenty of storage space with his/hers closets, plus a large master bath with a jetted tub. Additional bedrooms are ample size with spacious closets. Updates include a NEW HVAC SYSTEM IN 2011 AND ROOF IN 2013, indoor laundry, and an affordable reclaimed water irrigation system. THE FABULOUS BACKYARD PARADISE PROVIDES A RESORT-LIKE SETTING WITH A SPARKLING IN-GROUND POOL & SPA, surrounded by plenty of green space to spread out and spectacular views of the beautifully maintained golf course. Evenings are a dream in this backyard, with no rear neighbors or intrusive lighting once the golf course closes each day. 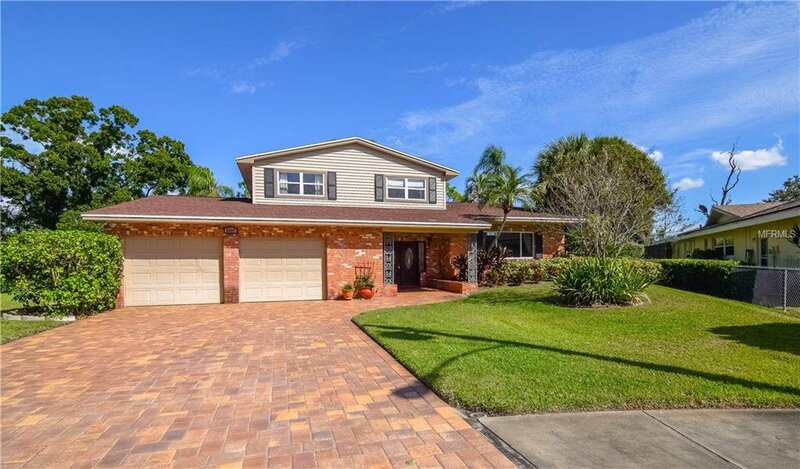 Located close to schools, shopping & gorgeous Gulf beaches, this home is not to be missed! Listing courtesy of KELLER WILLIAMS RLTY SEMINOLE. Selling Office: KELLER WILLIAMS RLTY SEMINOLE.